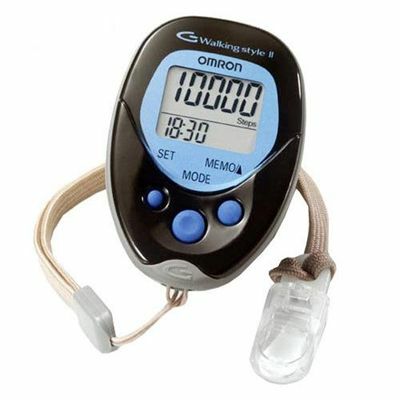 The Omron HJ113 has a dual display function that can show both the time and the number of steps simultaneously. Its memory function can store and show seven days worth of data. A fun and useful way to quantify all that great "burn" you're feeling. Besides a regular step counter, the Omron HJ113 also features an aerobic step counter, which counts the number of steady steps. Steady – or aerobic - steps are the physical exercise that helps us stay healthy. Steady steps are counted separately when walking or jogging more than 60 steps per minute or more than 10 minutes simultaneously. If a rest of less than 1 minute is taken after a continuous walk of more than 10 minutes, this will be regarded as part of “continuous (or aerobic or steady) walk”. For example: If you walk 120 steps per minute for 20 minutes, the number of steady steps” will be 2400.
for submitting product review about Omron Pedometer HJ113.